A group portrait at Rebel Circus Arts during an AcroYoga workshop. ‘Tis the season for cookies, casseroles and feasting galore. With the holidays in full swing and food-oriented gatherings packing the calendar, how is one to keep from turning into a version of their own personal, pot-bellied Santa? Exercise is a good place to start. While classic cardio and strength-training routines can certainly do the trick, tons of other options exist if the thought of going to a gym makes you cringe. From belly dancing classes that work those abs to salsa socials destined to get your heart rate up to rock climbing workouts sure to leave your arms a little shaky, we’ve rounded up some alternative ways get your sweat on. Read on to learn about seven out-of-the-ordinary (and super fun) workout classes available in Philadelphia. 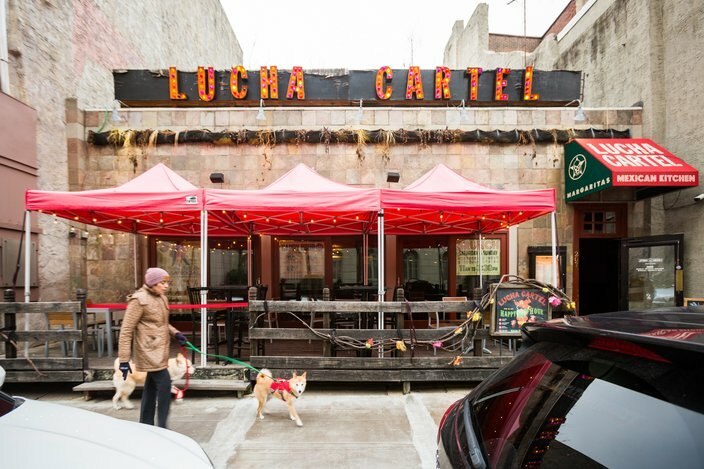 Lucha Cartel, 207 Chestnut St. If you’re a night owl that likes to dance, this workout option is for you. Every third Thursday of the month, Old City’s Lucha Cartel hosts a $5 salsa night, which kicks off at 10 p.m. with an expert-led lesson. An instructor from the Art in Motion Dance Academy will teach you the basics, and then you’ll be invited to show off your new moves and groove to live, DJ-spun beats all night long. Stay until closing at 2 a.m. and you’re guaranteed to reap some aerobic benefits as well as tone those legs and abs. An instructor group class at Pole Haus, 1719 Chestnut St.
Those who’ve tried pole dancing are often quick to tell you, “It’s harder than it looks.” Not only does it target muscles across nearly every part of your body, but it’s often known to boost confidence levels too. Recognized as a supportive and approachable environment, Center City’s Pole Haus offers $25 drop-in classes for those who are curious to give the pole a (literal) spin. If you get hooked on the aerial thrill, unlimited class memberships are available, too. Pole Haus, 1719 Chestnut St.
AcroYoga combines the zenful philosophy of yoga with the playfulness of acrobatics. The practice involves at least two people who lift one another off the ground using acrobatic techniques. The partner on the ground is considered the base. Meanwhile, the AcroYogi on the top engages in what’s called “flying” -- a fun concept that few other workouts can boast of entailing. 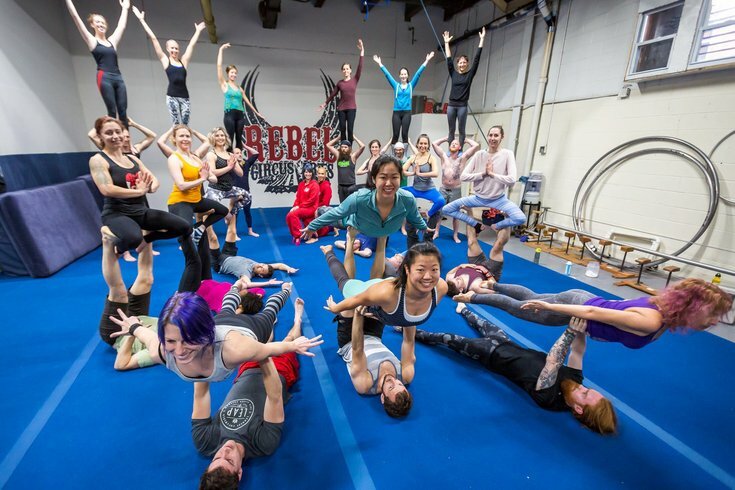 Port Richmond’s Rebel Circus Arts offers a variety of AcroYoga classes, including sessions for beginners and therapeutic AcroYoga and Thai massage courses. The 90-minute beginner’s class is $18 for a drop-in. Rebel Circus Arts, 2850 Chatham St. Studio 1831, 1831 Brandywine St.
Sure, belly dancing will work your core, tone your glutes and build up your back muscles. But perhaps just as significant, it will also impress your friends when you go to randomly utilize your new skills on the dance floor. There are few better dance floor conversation starters than hip shimmies and figure-eight belly rolls. 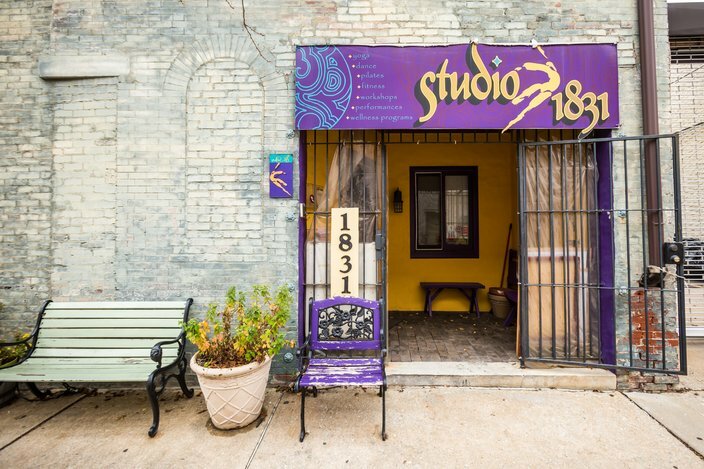 Head to Studio 1831 in Fairmount to learn the art of hip circles, hip drops and lifts, snake hips, those aforementioned figure-eights and more. A single class runs at $14 and multi-class passes are available, too. Rebecca Lewandowski climbs a lead route at Go Vertical indoor climbing gym. 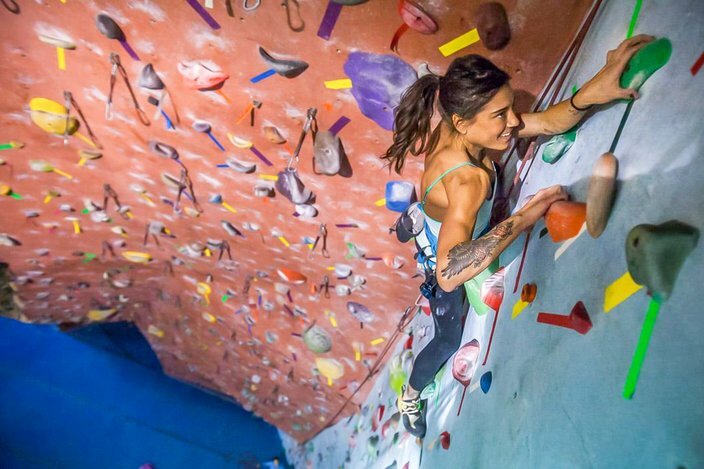 Grab a partner and climb your workout routine to new heights at Northern Liberties’ indoor rock climbing gym, Go Vertical. The spot features a beginner’s learning area, 250 different suggested climbing routes, a bouldering area and daily classes for those new to the sport. While an obvious upper-body exercise, rock climbing will also utilize your leg and ab muscles as your body attempts to find balance with each step up. Prices at Go Vertical vary per day (peak time vs. non-peak time) and equipment is available for rental onsite. Go Vertical, 950 North Penn St. Circus performer and instructor, Rachel Lancaster, hangs from the ceiling of the Philadelphia School of Circus Arts during a silks act during the 'Cabaret Pinot Noir' performance on Saturday, June 4, 2016. Ever dream of swinging on a trapeze? Or wish to fly in the air with aerial fabrics? 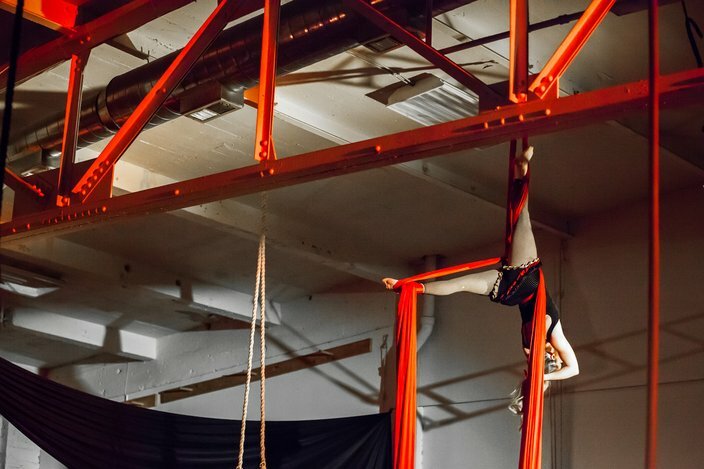 Classes at the Philadelphia School of Circus Arts range everywhere from handstand-focused lessons to trapeze workouts to contortion courses designed to (safely) flex the body in all directions. The classes are anything but ordinary and welcome those of all levels who want to improve their fitness levels, work on coordination skills and/or simply learn something fun and new. Philadelphia School of Circus Arts, 6452 Greene St. 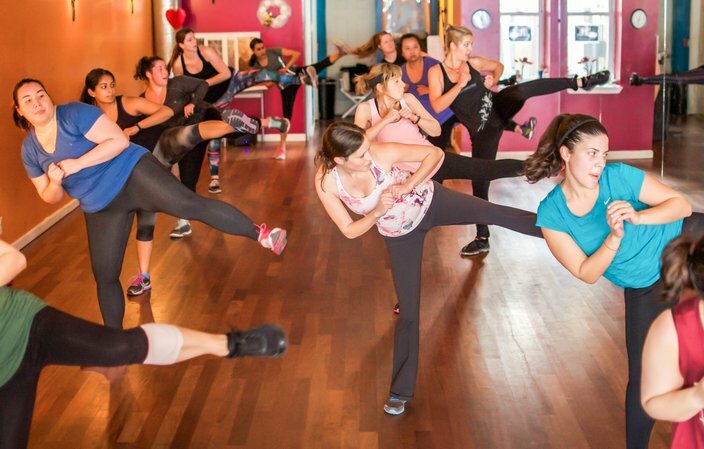 The Dance Party Boot Camp class at Philly Dance Fitness, 1624 South St.
For those seeking a workout that’ll burn those calories like any standard cardio machine would, but on a whole other level of fun, try Philly Dance Fitness’ Dance Party Bootcamp class. The 50-minute group session takes high-intensity interval training and turns it into a choreographed dance routine. As you groove, you’ll be instructed to engage in explosive, athletic exercises that are destined to get your heart pumping. The multi-location studio also offers other dance workouts ranging from jazz-inspired routines to Bollywood classes to hip-hop sessions. Most group classes are priced at $13 for a drop-in.